Forget Chex Mix. 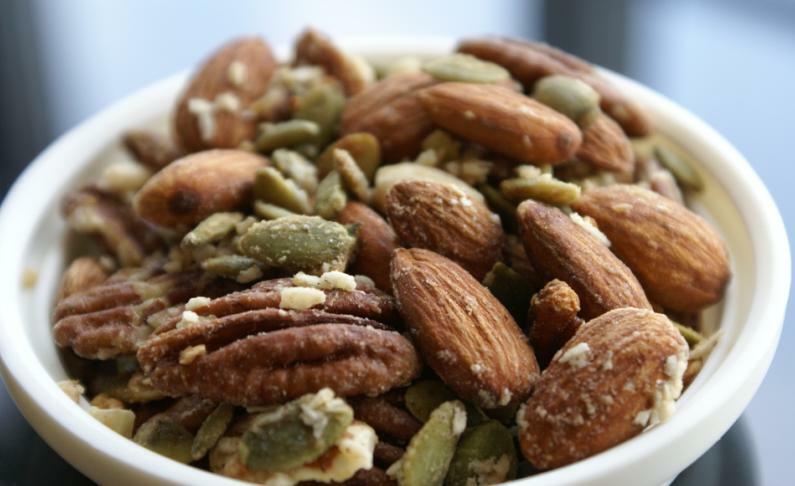 This Paleo nut mix was a great addition to a superbowl party we had awhile back. I made this in large batches because it holds well and serves great for on-the-road snacks when you’re in need of a tasty snack but are sick of plain nuts. Because sometimes you feel like a nut, sometimes you don’t. But feel free to use any nuts you have – I did a blend of nuts and seeds which were quite tasty. On a large baking tray lined with parchment paper, mix your almonds, walnuts and seeds together with your coconut flour. Then pour the honey slowly over the nuts – you’re not going to cover all of them but that’s ok. Then use your hands to mix all of the nuts and honey together. Warning: this is a messy process! Once you’ve mixed as thoroughly as you can, add the coconut flakes and mix around again. Some nuts and seeds will have more coconut flakes on them but that’s ok. As my husband says, it’s the element of surprise that keeps you going back to get that special extra honey and coconut cloaked nut. This recipe inspired me to do a blend of different flavors. Next time I’ll try a spicy version! Bake in oven for 20 minutes. You can serve immediately or wait until they cool down. Enjoy! Day 14 of the paleo challenge. Nearly everyone in our friendly food challenge (30+ people!!) has been sticking to this challenge and taking it very seriously. We have already had success stories just two weeks into the challenge – many people feel better and have more energy by simply changing their diet to eat better and more natural foods. The great perk for me is to be inspired by all of the creative recipes that we’ve seen so far. 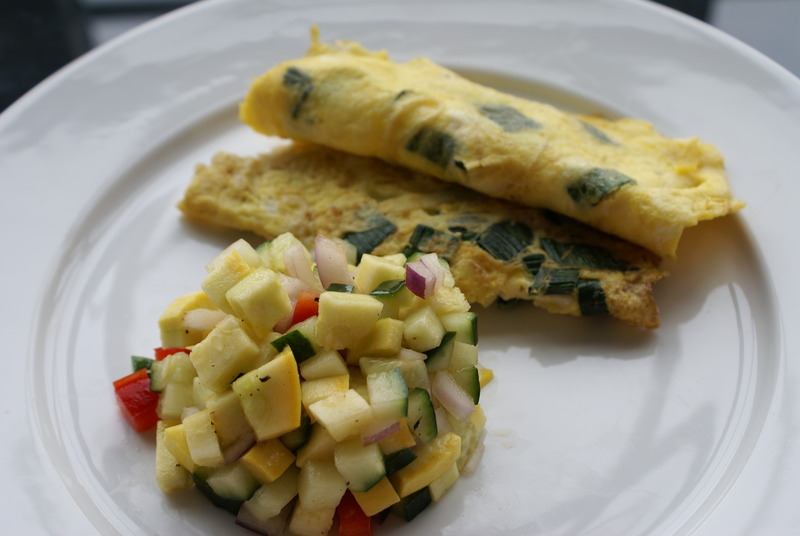 Paleo dining doesn’t have to be boring I promise! Here’s one dish (hat tip Lukshmi) that is simple and delicious. You can add it as a great vegetable side for breakfast, lunch or dinner. My friend made it on Paleo Indian food night as a substitute for raita (no yogurt). It was simple and incredibly delicious and requires NO cooking! All you need to do with this dish is some chopping. And that shouldn’t be a problem because we all know you’ve been working on knife skills to impress Tom Colicchio. This dish is extremely versatile and you can add many other herbs, seasonings and/or vegetables like cumin, mint or tomatoes. I just used some vegetables in my fridge but try to experiment and play around with the colors & flavors! Dice your vegetables. Add salt and pepper to taste and juice about 1 tablespoon of lemon juice on top. Mix well. No seriously – that’s it. Serve and enjoy! Day 8 of the paleo challenge. 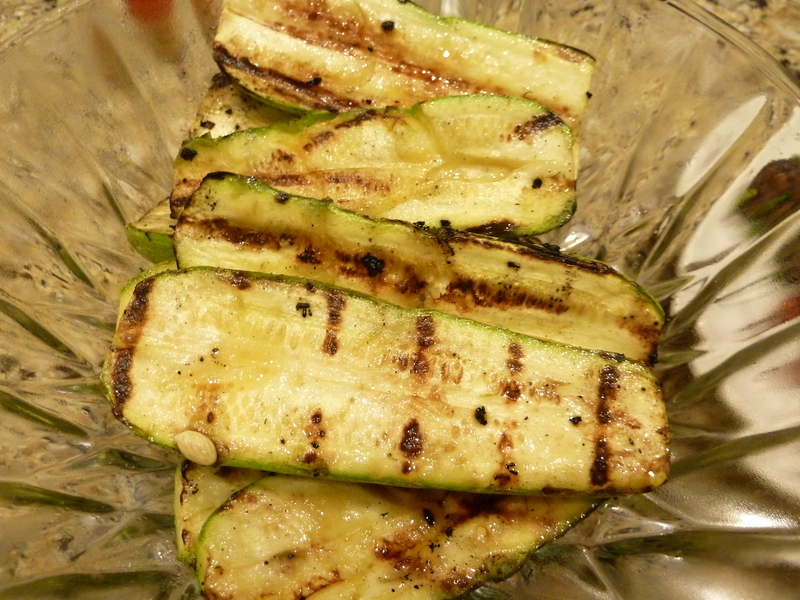 Sometimes simple is amazing, like this grilled squash. I found this one of the tastiest vegetable dishes I’ve had in a really long time. It made me laugh, it made me cry. Ok not really but it did put a smile on my face. Just like this simple wedding dance number down the aisle. If you don’t laugh at the 40 second mark for awhile like I do, we can’t be paleo friends. Isn’t eating supposed to be about sweet, natural fun like this? I think so too. Wash and halve the squash. Coat with olive oil and grill on each side for 5 minutes on high heat. Add salt and pepper as desire. Serve and enjoy! No seriously – it’s that simple and delicious. Day 7 of the paleo challenge! I love cauliflower rice and have used it as a side dish multiple times in the past week. For Week 2, I think I’ll be eating a lot of this dish. 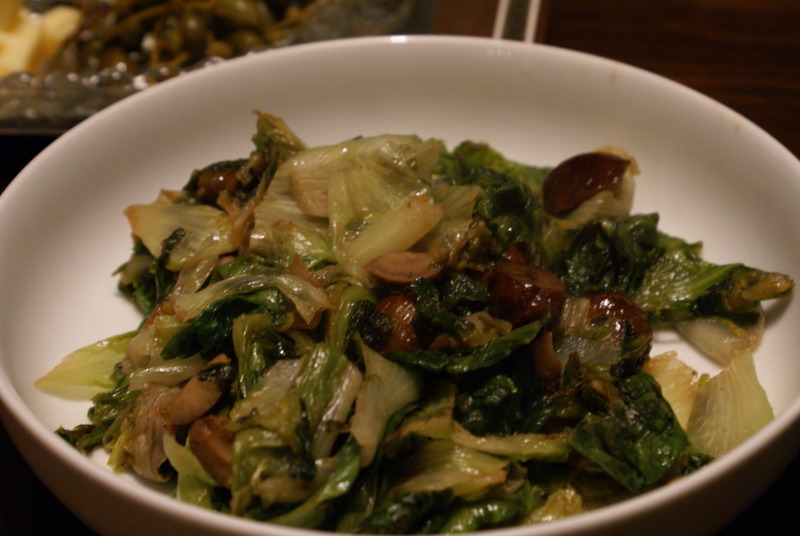 I love brussels sprouts and find it incredibly versatile. I love it with pine nuts, with bacon, with cheese, and even a combination of all the above. When I’m in a rush, this is the recipe I go to for a quick and tasty vegetable side to my meals. The apples add a nice sweet balance to the brussels sprouts. Enjoy! Cut off the ends of the brussels sprouts and take off any wilted outer leaves. Halve the brussels sprouts (you can leave whole if you like). Take your apple and chop into small pieces (I like mine roughly around the size you would find in a fruit cup). 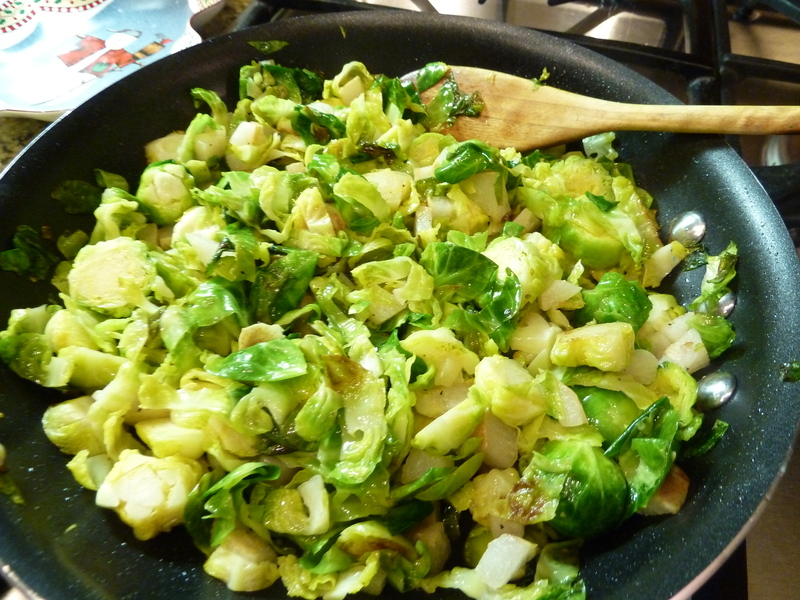 Add some olive oil in a heated pan and add the brussels sprouts. Stir frequently for 5 minutes and add salt and pepper to taste. Add the chopped apple and stir for an additional 5 minutes. That’s it! Serve and enjoy! Best served immediately. Day 3 of paleo challenge. Hard boiled eggs. Gotta love ’em! During the paleo challenge – I keep a fair amount in the fridge when I need a great, quick snack. It’s perfect for those mornings when I have no time to make an omelette or anything fancy. Here’s a nice way to sprucen up hard boiled eggs (hat tip BJ). I used the whole seaweed paper this time but that’s just because I accidently bought the wrong seaweed. I prefer these little seaweed snacks from Sea’s Gift. Great little snack and wraps a bite sized portion perfectly. In a small bowl, mash up your hard boiled eggs with a fork to a desired consistency. 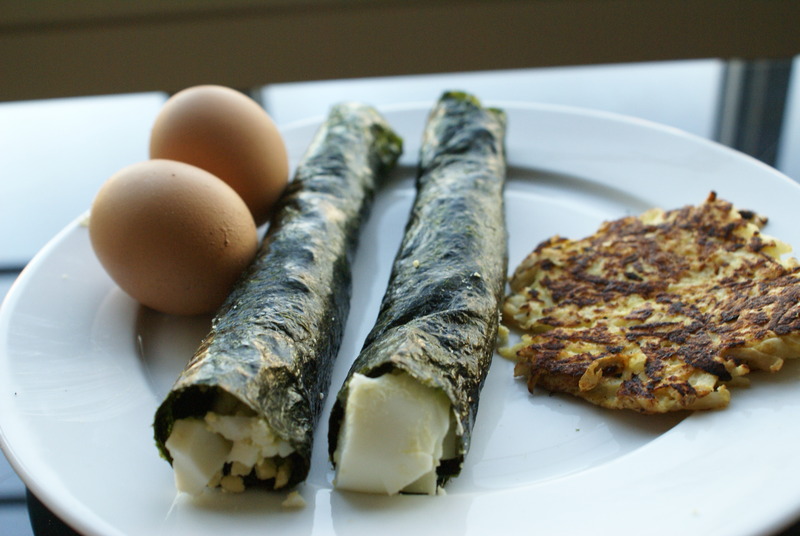 Then simply take your bite sized kim nori (seaweed snack paper) and wrap around the mashed eggs. My breakfast this morning was served with a turnip latke. Delicious breakfast! Next time – I’ll try to add a nice creamy avocado to the eggs. Maybe even some bacon to make it crazy. YUMBO! Day 2 of our food challenge and I already need variety. As much as I love eggs in the morning, I get a bit tired of having them every morning for breakfast. So I had leftovers and made this as a side dish. It turned out great! Turnips are low in calories, high in Vitamin C and fiber. Try it for a potato alternative! With a knife – simply cut/peel off the turnip skin. Then using a large grater, take the turnip and grate it. Once you have the grated turnip, take a paper towel and squeeze out the excess liquid. In a medium bowl, mix the grated turnip, egg and a pinch of salt and pepper. Mix thoroughly. In a heated pan, add some olive oil and fry the latkes for 3-4 minutes or until golden brown on each side. 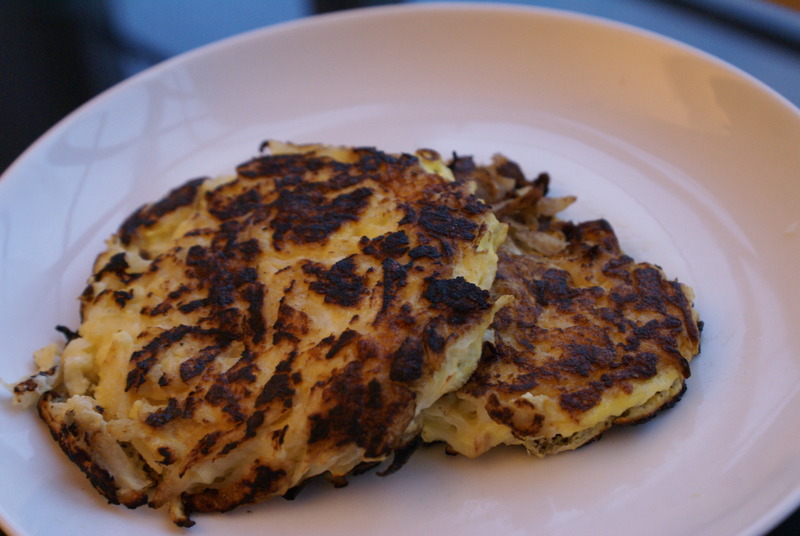 This recipe makes 2 latkes so spoon out half the bowl and it makes one nice sized latke. I loved how simple and easy this recipe is. You can serve with some apple butter and cinnamon or chives and sour cream (if you’re lacto-paleo like me). Best served immediately. Enjoy! Happy New Year! I love fresh starts – everyone seems more refreshed, recharged and ready to take on new things. My husband and I were so positively impacted by the paleo diet when our CrossFit initiated a food challenge last year. We jokingly said we should do one with our friends/family who weren’t into CrossFit because everyone wants to eat better but needs more motivation. Even though many thought we were crazy while we were doing the paleo challenge for 7 weeks, when we mentioned the idea of a friends/family version – people were so excited to try it themselves!! All they needed was a simple boost. We ended up getting 35 friends and family to do a food challenge with us. So for the next 45 days, I’ll be even more focused on creative paleo recipes as we do the challenge with them. 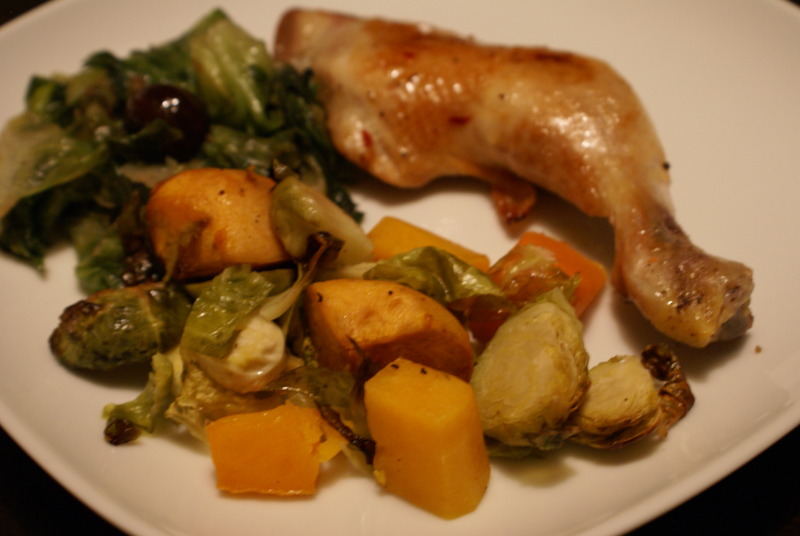 Coming up with tasty recipes was the hardest part about paleo, at least for me. Here’s one simple dish I cooked for my family last week. Growing up in an Asian household – rice is a staple. My mom still thinks we’re crazy to give up grains but she did agree that plain cauliflower was a ‘decent’ alternative to rice. Not necessarily a compliment but I’ll take that from her! Trim and chop cauliflower to a rice-like consistency (I just used a large kitchen knife – you can also use a blender to finely chop it as well). Once you have coarsely chopped the cauliflower, you can microwave for 5 minutes. You don’t need water because there’s enough moisture in the cauliflower. If you are anti-microwave you can steam it for about 10 minutes (or until desired texture). This is a very plain dish but a great way to get a vegetable in and substitute for a rice texture. You can get really creative with this dish by adding onions, garlic, seasonings, etc. I’ll make sure to post more flavorful recipes of this as I cook with it. For now, I end up making this with anything full of sauces since cauliflower ends up soaking it up. 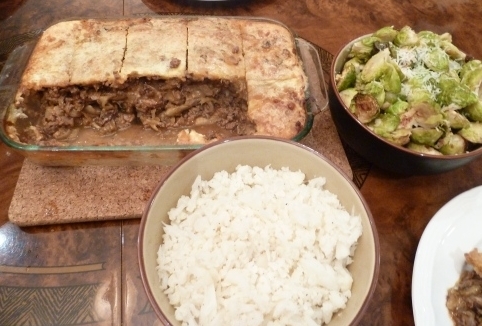 In this picture I ate it with my beef and eggplant lasagna and sauteed brussel sprouts. My 10 month old niece loved to eat the plain cauliflower – surprisingly! Let me know what other flavors you try adding to the cauliflower rice! I had a group dinner awhile back that included sauteed escarole with white beans that I thought was delicious. To make a paleo version for my husband, I decided to substitute the white beans with roasted chestnuts and the results were terrific. The chestnuts neutralized the slight bitterness of the escarole with a sweetness of it’s own. The picture didn’t turn out too well but I promise it’s tasty! Clean your escarole and chop into 2-3 inch pieces. In a large skillet, heat oil over medium. Add garlic and sautee for a couple of minutes. Stir in escarole and stir frequently. You will see the leaves wilt down quickly. After a few minutes, add in the roasted chestnuts (I like to buy the pre-roasted chestnuts from Gefen) . Add in salt and pepper to taste, stir frequently for another 5 minutes until tender. Best served immediately and hot. Enjoy! I made some sides for a faux-Thanksgiving dinner party last week and my guests really liked it (or so they said – you never know when you’re a host). This recipe is as easy as it gets and quite tasty – I love brussel sprouts! Cut off the ends of the brussels sprouts and take off any wilted outer leaves. Halve the brussels sprouts (you can leave whole if you like). In a large mixing bowl, mix the sprouts and squash with the olive oil, salt and pepper. Pour them on an baking pan and roast for 35-40 minutes. Serve immediately. Enjoy! It’s beginning to look a lot like…winter. On chilly days – I’ve been craving a nice warm soup get me through the cold nights. This is a really simple but tasty recipe that I think everyone will enjoy – and it’s really good for you!! One thing to note – I’ve come to the conclusion that I’m a lacto-paleo (paleo diet that includes dairy). Feel free to take out the butter and cream – I’ve just realized that I can’t give up dairy! Cut the white and light green park of your leek and set aside (discard the green stalk). Then cut your cauliflower into smaller pieces (about 1-2 inch flowerets). In a baking pan – toss the cauliflower, garlic and leeks with your olive oil to coat and roast in the oven for 30 minutes. Once the cauliflower is done roasting, combine the veggies in a pot with your chicken stock and water. Stir frequently for a minute. Transfer the ingredients into a large mixing bowl. Using a handheld mixer – puree the soup until smooth (mine came out to be like the texture of grits). 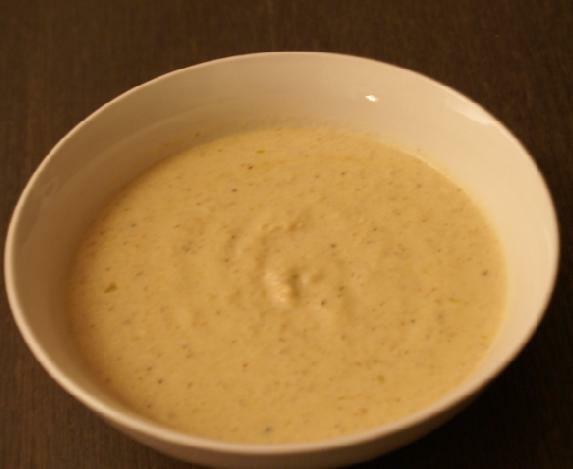 Return the soup contents to your pot and add the butter and cream (optional for non-lacto paleos). Add some salt and pepper to taste. Serve and enjoy!